Functional Medicine addresses the underlying causes of disease using a systems-oriented, individualized approach, which engages both you, the patient, and me, the practitioner, in a therapeutic partnership. Most people alive today have experienced Conventional Medicine – if you were born (or delivered) in a hospital, had an X-ray after an injury, antibiotics for strep throat, or rushed a loved one in for emergency appendectomy, you have encountered Western society’s traditional approach to health care. This approach focuses on the diagnosis and treatment of ACUTE symptoms of trauma and illness and it can be lifesaving! This disease-centered focus is great at naming diagnoses by body part and prescribing interventions like surgery or drugs for urgent symptoms. However, this ACUTE-care model is lacking when it comes to the prevention and treatment of an individual’s CHRONIC disease with complex symptoms and a unique (often messy) life story. Functional Medicine addresses your whole health story: your medical history (from gestation through today), and discovers how your unique genetic, social, environmental, and lifestyle factors influence current symptoms as well as your future path towards illness or wellness. Often some event, loss, exposure, or change that might have been overlooked or disregarded by other providers actually coincides with the onset of symptoms or was the “straw that broke the camel’s back.” Disease or dysfunction rarely arise from a single event. When you can truly visualize all the details of your unique history, the storms and flurries, sometimes you start to see the origins and accumulation of the “Perfect Storm” that becomes your current health status. 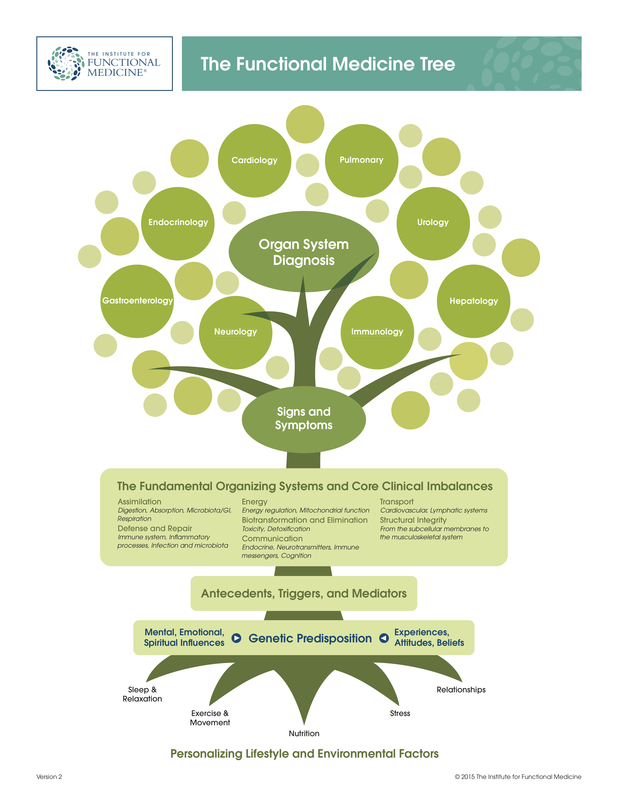 In Functional Medicine, we like to dig deeper and look for the underlying root causes of symptoms so that you, an amazing system of interconnected pieces, can become more balanced, whole, and FUNCTIONAL!